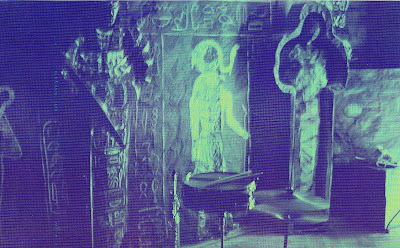 a) H. R. Giger in his artwork has often used ancient Egyptian themes and ideas, and some of these he brought into the concept work for Alien, many of which can be found as illustrations in the Egyptian Book of the Dead. 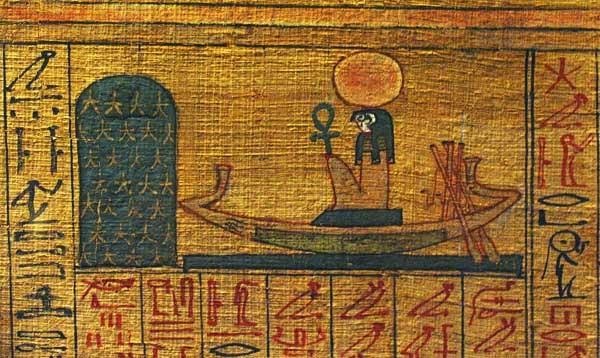 b) When he was about six years, every Sunday he went to the civic museum in Chur and in the basement with the amputated hands and feet they kept a beautiful mummified body of what he believed was an Egyptian princess and her sarcophagus. 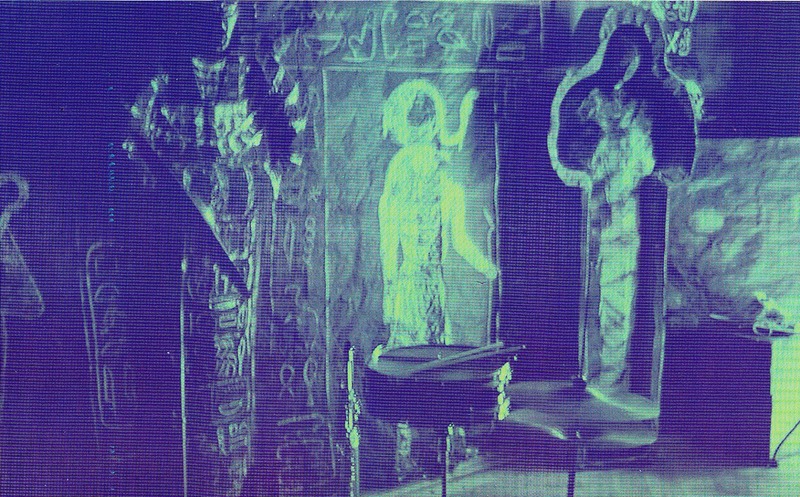 c) His keen interest in such Egyptian imagery can be seen on the decorations of the wall of his black room (above) where he used to hold parties and play with his band as a teenager. 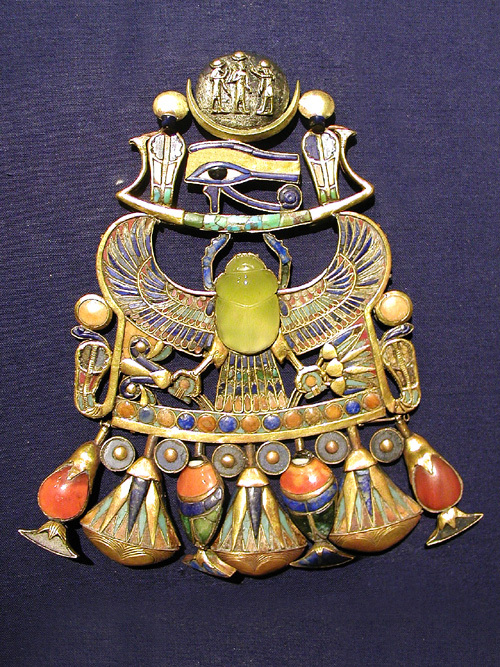 In the centre of the photo is an image of the God Ra holding a was-sceptre. d) The way he did his portraits Giger consider typically Egyptian as well, in the way they presented a view from from the side and the front. 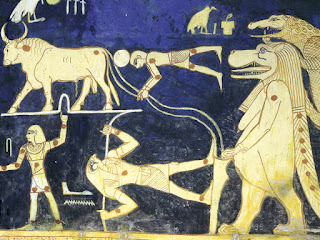 So the Egyptian style was something that he considered part of his way of expressing through art. 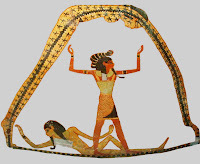 In his work for the Alien Life Cycle Hieroglyphic tableau, he incorporated the image of the Goddess Nut. Giger's painting Necronom IV which became starting point for the final adult alien creature, but where did the idea for the thing spring from. 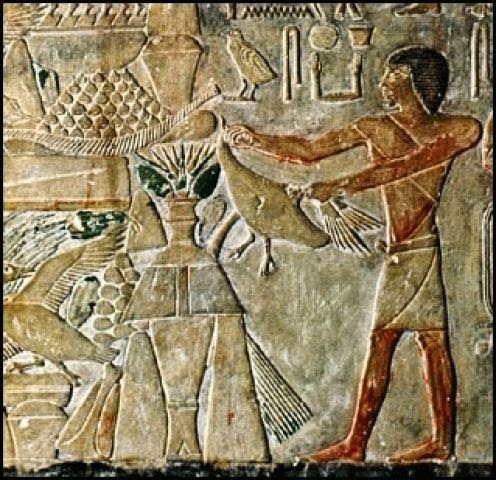 While it's composed of ideas that he developed over time, one can see that it incorporates elements from depictions of the ancient Egyptian embalming ritual images. The strange rounded shoulder of the Necronom IV displays a likeness to those in the Ancient Egyptian's depictions of lions. Giger's Necronom IV backpipes when the painting is flipped over become the upper eyeline and eyebrow of the eye of Horus. 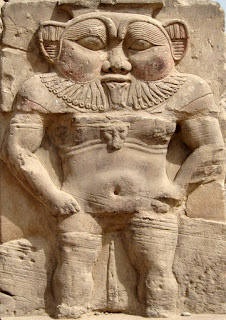 viii) Was-Sceptre, the head of the alien? Was-Sceptre. the hammerhead tip of the derelict? The general form of the head of the Necronom IV looks inspired by the general form of the stylised head of a was-sceptre. 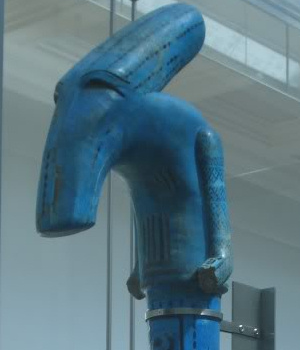 The was-sceptre in the photo, now to be found at the Victorian and Albert museum resembles Giger's initial design for the derelict ship's hammer head. ix) Alien with goggles inspired by relief of lotus blossom? This second concept design for the Alien stage 3 beast appears to have goggles. Was it inspired by Egyptian depictions of lotus blossoms? x) Derelict experior inspired by "Barge of a million years"? 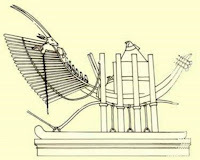 Was the initial derelict concept inspired by the Solar Barge of Egyptian mythology and does it just naturally loosely merge with the concept of a "Barge of a million years". 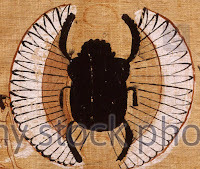 Was the Egyptian scarab as book of the dead imagery and jewelry the foundations of Necronom II? Necronom II directly references the Desert Glass pectoral which as a piece has inspired many artists and designers over the decade and so the Desert Glass Pectoral creeps in transformed way into a number visually famous pieces. I was interested to read that HR Giger was inspired by an egyptian mummy so I sought out who exactly it was (if it was a significant royal or person in life) It is the "Ta-di-Isis, Rätisches Museum Chur"